Micha is a multi-award nominated journalist and Arts and Culture Editor of gal-dem. She was former Welfare and Rights Officer of Cambridge University's students' unions, and founded Blueprint, a magazine that focuses on mental health. 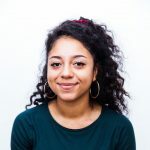 Micha currently writes for HuffPost UK and the Guardian, and is interested in psychology, pop culture, gender, race and mixedness.